Elliot Gordon '74 has been involved with Windward School for over forty years. He was one of the founding students of the school in 1971, and is now the Chair of the Board of Trustees of Windward School, as well as the proud father of a Windward alum, Daniel ’10. After graduating from Windward School, Elliot attended Haverford College in Pennsylvania, and then got masters and law degrees from Harvard University. Professionally, Elliot has practiced law for over thirty years, both at major, national law firms, and as an in­house counsel for two of the country’s largest healthcare companies. In 2015, Elliot left the corporate world to become a mediator and arbitrator, using his legal experience to help parties involved in litigation to resolve their disputes. 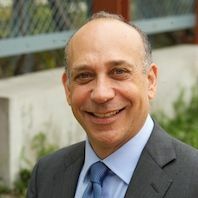 Elliot has also been involved in community organizations; in addition to his service to Windward School, he serves on the Board of Directors of Inner City Law Center, which provides legal assistance to the homeless and veterans, and sits on the City of Santa Monica’s Personnel Board.